Heat oven to 375°F. Spray 2 large cookie sheets with cooking spray. Cook spinach in microwave as directed on box. Drain spinach; cool 5 minutes. Carefully squeeze spinach with paper towels to drain completely. In food processor, place spinach, cream cheese, sour cream, pesto, vinegar, salt and pepper. Cover; process until well blended. Cover; refrigerate while preparing crostini. In small bowl, mix cheese and garlic; set aside. Place dough on cutting board. Using sharp serrated knife, cut dough into 1/4-inch slices; place 1/2 inch apart on cookie sheets. Press slices with fingers into 2-inch rounds. Brush rounds with 2 tablespoons of the oil; sprinkle with half of the cheese mixture. Bake 5 minutes. Remove from oven; turn crostini. Brush with remaining 2 tablespoons oil; sprinkle with remaining cheese mixture. Bake 5 to 10 minutes longer or until golden brown and crisp. Remove from cookie sheets to cooling racks; cool 5 minutes. 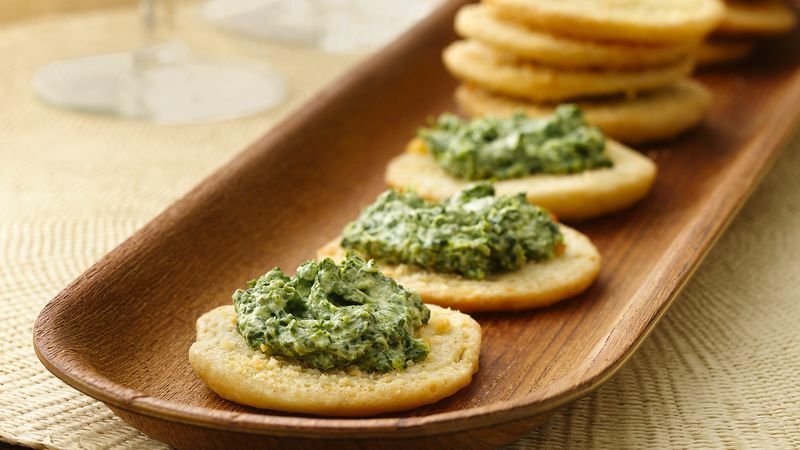 Serve warm with spinach-pesto spread.